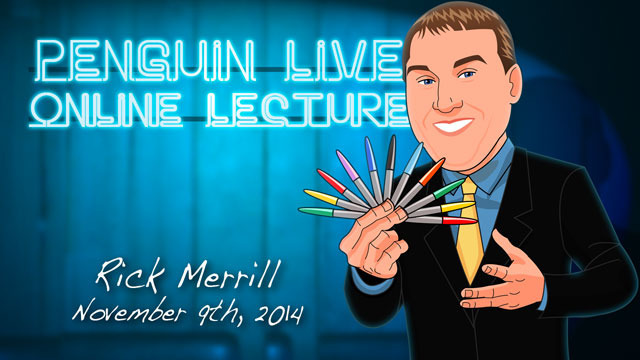 Today, when you order "Rick Merrill LIVE", you'll instantly be emailed a Penguin Magic gift certificate. You can spend it on anything you like at Penguin, just like cash. Just complete your order as normal, and within seconds you'll get an email with your gift certificate. Rick Merrill LIVE (Penguin LIVE) FISM Award-Winning Magic and Comedy SUPPORT LIVE MAGIC. DOWNLOAD THE FULL LECTURE TODAY. Rick’s Stand-Up Opener – A multiple selection card routine filled with unique and entertaining revelations, original comedy, and great thinking. This is the routine Rick has used to open his stand-up show for more than 10 years. It’s filled with laughs and magical moments… and just wait until you see the method! Rick’s Close-Up Opener – After cutting his teeth in restaurants for more than 7 years, Rick tips his opening close-up routine along with all his lines and gags. He also explains the psychology behind his patter and why it works for him. Three Change – A three coin routine where the coins change but do not fly. Visual coin magic. Royal Cut Flush – An amazing display of card skill without the hours of practice. The method is almost as amazing as the effect! Coin and Marker – The basis for Rick’s Grand Prix FISM act involves a sharpie marker and a Morgan silver dollar. With these two items, Rick will show you how you can perform mind-blowing magic that’s both visual and entertaining! Sleeving – Rick shares his work on this useful and secret technique. Empty Hand Vanish – Learn how to vanish a pen, pencil, or marker – with your sleeves rolled up! Pure sneakiness! Sharpie to Pencil – One of the most visual pieces of magic in existence! A sharpie morphs into a pencil and then back into a sharpie right in front of your eyes! Plus Rick will share stories from FISM, his travels abroad, magic competition, and useful thoughts on creating original magic! You’re guaranteed to laugh and have a great time! 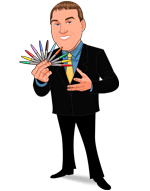 Most people know Rick Merrill won the FISM Grand Prix in 2006 in Stockholm, Sweden. What many do not know is, in addition to his Grand Prix win, Rick also won the rarely-awarded Comedy Award at FISM. Since FISM, Rick has traveled the world with his unique brand of comedy and magic. He’s performed on TV and in more than a dozen countries. A magician and comedian, Rick Merrill, holds the title of World Champion Close-Up Magic. Crowned in 2006 at the World Championships of Magic in Stockholm, Sweden he has since become a featured performer at the world famous Magic Castle in Hollywood and performed in person and on television in more than a dozen different countries. Most recently, he filmed his first US television appearance on a special for FOX-TV. It was 2003 when Rick first began to develop the magic act that would eventually take him around the world. By 2004, Rick had won the top prize at national conventions of the International Brotherhood of Magicians and the Society of American Magicians, the two largest and oldest magic organizations in North America. In addition to 1st Place, Rick brought home awards in Originality and Comedy. The biggest compliment, however, may have been the “People’s Choice” distinction awarded to him at both conventions. After this national success, Rick prepared to walk onto the international stage. In 2006, Rick represented the United States at the World Championships of Magic in Stockholm, Sweden. This event occurs every three years to select the best-of-the-best in the world of magic. When the dust settled, Rick was crowned World Champion in Close-Up Magic and became only the 4th American to win this award in the 60 year history of the event. 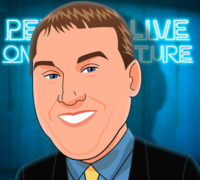 Purchase the Rick Merrill LIVE product. This is your ticket. I quite liked this lecture and though it was very good the reason I gave it 4 stars is because there are many others I liked quite a lot more. He does explain a fair amount of materiel, some of which will almost definitely get your creative juices flowing. I thought this lecture was great, but not outstanding, like Jason England or Jay Scott Berry. Still it's well worth checking out and I do recommend it. And if you're not aware of his work this is a terrific introduction. There were some technical glitches on the live feed, but they didn't effect the download at all. If you are into sleight of hand this is great lesson with sleeving. Nothing else, that is why I "only" gave 4/5. You don't become a world champion by going half way. The only way to become world champion is to think through every last detail of your act and workshop it over and over again. That is what Rick did and in this lecture, you will learn every single detail of Rick's magic. Even if you never use a single move that Rick taught, just paying attention to the level of thinking that he brings to his magic will make your magic better. This lecture is for people who take their magic seriously. Easily one of Penguin's best. Interesting routines, I am happy to have bought Rick Merrill video. The routine with the coin and sharper is especially fantastic. Great material and really hilarious. great materiel, entertaining and inspirational. I gave it a 4 out of 5 because the "live" was faulty. it was funny but if your younger like me (13) a parent might get mad at you so 4 stars!